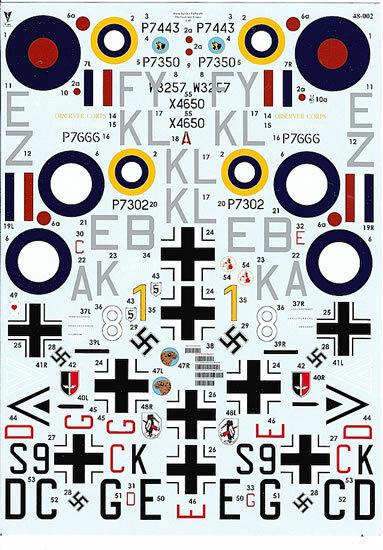 In 2010 the organisers of the Southern Expo Model Show, which is held annually at Hornchurch in the UK, issued a limited edition decal sheet to commemorate the former RAF base’s famous role in the Battle of Britain 70 years earlier. You may see the HyperScale review by following this link. The sheet was well-received and prompted Southern Expo to continue the theme at this year’s show, with the release of “Hornchurch v Luftwaffe – Lean into France” in 1/48 and 1/72 scales. Like the earlier release, “Lean into France”, showcases both Hornchurch-based RAF fighters and their Luftwaffe opponents. As the title suggests, it focuses on the air war in the months after the Battle of Britain, when the RAF began to push back against the Luftwaffe through a series of frequently costly sweeps and incursions. Spitfire Mk.IIa, P7666/EB-Z, “Observer Corps” flown by Squadron Leader Donald Finlay of No.41 Squadron, RAF Hornchurch, February 1941 (not February 1940 as indicated on the marking guide). Spitfire Mk.IIa, P7666/KL-Z, “Observer Corps” flown by Sergeant Jack Stokoe of No.41 Squadron, RAF Hornchurch, April 1941. Spitfire Mk.IIa, P7302/EB-A, flown by Sergeant John McAdam of No.41 Squadron, RAF Hornchurch, February 1941. Spitfire Mk.Vb, W3257/FY-E, flown by Flight Lieutenant Eric Stanley Lock of No.611 Squadron, RAF Hornchurch, August 1941. Spitfire Mk.Ia, X4650/KL-A, flown by Sergeant Harold Squire of No.54 Squadron, RAF Catterick, 28 December 1940. Spitfire Mk.IIa, P7443/KL-K, flown by Sergeant Harold Squire of No.54 Squadron, RAF Hornchurch, February 1941. Spitfire Mk.IIa, P7350/EB-Z, “Observer Corps” of the Battle of Britain Memorial Flight – the oldest Spitfire currently flying, and one with a distinguished operational record while based at Hornchurch in 1940. Messerschmitt Bf 110D-0/B, “S9+C/D/E/GK” of 2./Eprobungsgruppe 210 (‘Test Wing 210’), Abbeville, April 1941. 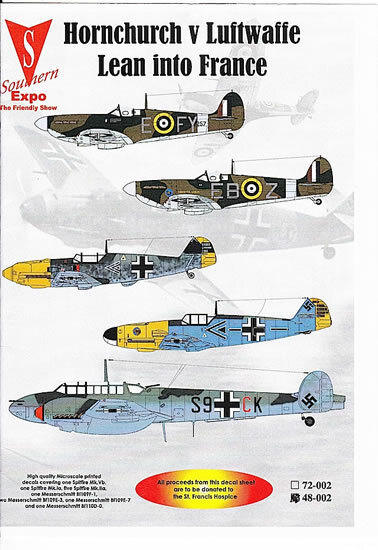 Because Southern Expo’s researchers were unable to determine the third letter of the Bf 110’s code – and therefore the precise identity of the aircraft – they have provided modelers with a range of options from which to choose. Messerschmitt Bf 109F-1, “Black Chevron and Bars”, flown by Geschwaderkommodore Werner Molders of JG51, May 1941. Messerschmitt Bf 109E-3, “White Chevrons”, flown by Hauptmann Herbert Ihlefeld of JG52, February 1941. Messerschmitt Bf 109E-3, “Yellow 1”, flown by Hauptmann Herbert Ihlefeld of I. (J)/LG2, late 1940. 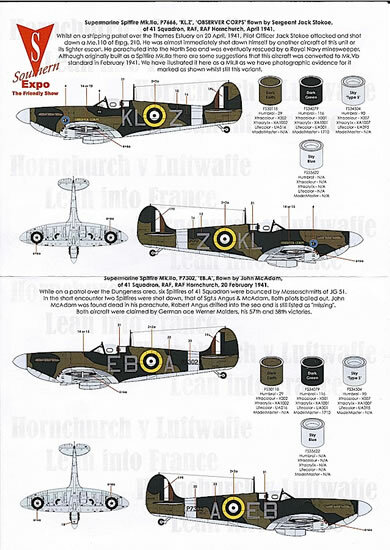 The four double-sided A4 pages of instructions are nicely done, featuring full-colour four-view drawings of each aircraft, with individual painting and marking differences clearly highlighted. 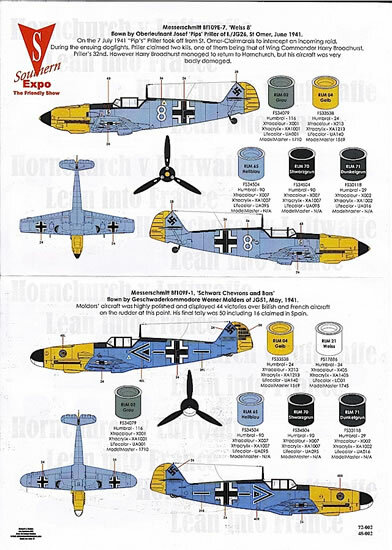 There are a few minor typos, and some errors in the paint cross-reference guide for the Luftwaffe aircraft – which I wouldn’t have noticed if not for the small errata sheet included with the main instructions, so well done to Southern Expo for both acknowledging and correcting the mistake. I also appreciated the brief story about each aircraft, explaining its significance and – where known – the fate of the pilot who flew it. The decals themselves appear to be high quality, with good colour, density, and some fine detail in both 1/48 and 1/72 scale. There are a couple of minor quality control issues, with some out-of-register unit emblems and a bit of fluff trapped beneath one of the RAF roundels (which has affected the ink density and might be obvious on a finished model), but nothing else to really worry about. No stencils are provided, but these should not be difficult to source for any of the featured aircraft. “Lean into France” is a well-produced and presented decal package which, while not widely available, is well worth tracking down, especially if you have any interest in early war clashes along the Channel Front. Hopefully Southern Expo will continue the theme with a third release next year!